a Star City Games Standard Open in Washington, DC. Featured in multiple, distinct, strategies, Ugin, the Spirit Dragon was nevertheless only one of several Fate Reforged cards to make an immediate impact. 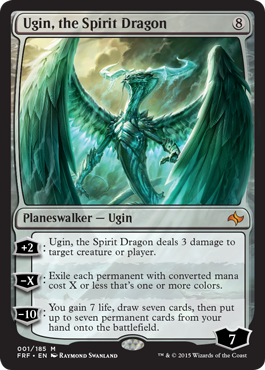 But what is the “secret combo” that Ugin, the Spirit Dragon shares with another one of Fate Reforged’s hot new additions? Patrick Chapin and Michael Flores run through a Standard Top 8 that features exciting new archetypes by Grand Prix Champion Gerard Fabiano and onetime US National Champion Ali Aintrazi, go all-in Azorius Heroic, and explore updates to metagame favorites like Boros Tokens, Abzan Aggro, and Abzan Midrange. According to Patrick, “the real reason” Birthing Pod was banned can be traced back to a single, solitary event. Wanna know what that event was? Listen to the podcast of course! Earlier this week our lords and masters in Renton, WA dropped the ban hammer on formats various. Chapin and Flores discuss bans in Vintage, Legacy, and Modern. How is Gifts Ungiven powered in Vintage, relative to Fact or Fiction? Treasure Cruise was restricted and / or banned in three different formats. What does the banning of Treasure Cruise in Legacy (but the not-affecting of Dig Through Time) mean for Wasteland? For Burn decks? Wanna feel really icky gooey gross inside? Come listen to Patrick’s rules explanation of Woldgorger Dragon in Constructed tournament play… Legacy or not. Patrick’s prediction for Legacy: B/G decks will be back with a vengeance! Lots of players have opinions about the Modern bannings… Patrick actually has to prepare for a Modern Pro Tour in the next couple of weeks! He shares some of his team’s preparation procedure for Pro Tours. Some people are “passionately” and “aggressively” … pretending they are quitting Magic over the bans. Thoughts? What are the implications of these Bannings on key decks in the Modern format? Will Splinter Twin return to dominance with a predicted de-emphasis on U/R Delver (thanks to the banning of Treasure Cruise? Will U/R Storm challenge Splinter Twin as the U/R combo deck of choice [for the same reasons]? What is the context in which you would actually want to play a Burn deck (in Modern or otherwise)? What will be the fates of Wild Nacatl, Vengevine, or the returning Golgari Grave-Troll in the new-look Modern? More of the modes on Abzan Charm! 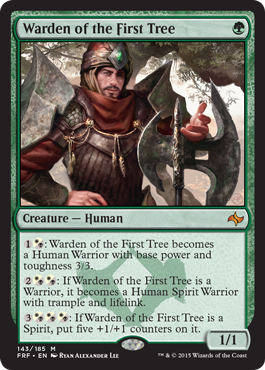 The first reason to “not be embarrassed” to play R/G or Temur? If you like this podcast, why not try some of our hosts’ books?